A controversial South Florida rapper who was attacked on stage and knocked unconscious while performing in San Diego last year was shot and killed near his Fort Lauderdale-area home. XXXTentacion, whose real name is Jahseh Onfroy, was fatally shot a little before 4 p.m. Monday outside a motorsports dealership in Deerfield Beach, FL, according to the Broward County Sheriff’s Office. The 20-year-old was struck by gunfire from two armed men during an apparent robbery. Amateur videos from the scene posted to social media showed Onfroy slumped in the driver’s seat of a matte black BMW i8. According to the website TMZ, the assailants made off with a Louis Vuitton bag from the rapper’s luxury car. Onfroy was best known for his song “Look at Me!” that improbably took off on the website Soundcloud after he was arrested in 2016 on domestic abuse charges. In a recent interview with Miami New Times at his home in Parkland, FL, the rapper denied the allegations, which were made by a girlfriend who was pregnant at the time. Onfroy was recently released from custody on house arrest while he awaited charges of aggravated battery on a pregnant victim, false imprisonment, strangulation, and witness tampering. During a performance at the Observatory North Park last June, Onfroy was knocked unconscious when a man rushed up to him and punched him as he performed a song barefoot on stage. The rapper was carried offstage as security guards struggled to subdue about 10 other combative people. At some point during the melee on June 7, 2017, a 19-year-old audience member suffered a stab wound to the back. He was taken to a hospital for treatment of a punctured lung, SDPD Officer Billy Hernandez said at the time. The University Avenue venue was emptied following the brawl and police remained on hand throughout the night to make sure the crowd dispersed. A day after the on-stage attack in North Park, police had made no arrests, and it was unclear Tuesday morning whether anyone was ever charged in connection to the chaotic concert events last June. In the online hip hop community, rumors swirled that the North Park attack was carried out by someone close to Lemon Grove rapper Rob $tone, whose real name is Jaylen Robinson. After news of Onfroy’s death broke Monday, Robinson posted a video from late last year that appeared to show the young musicians speaking on the phone and clearing up any disagreements. 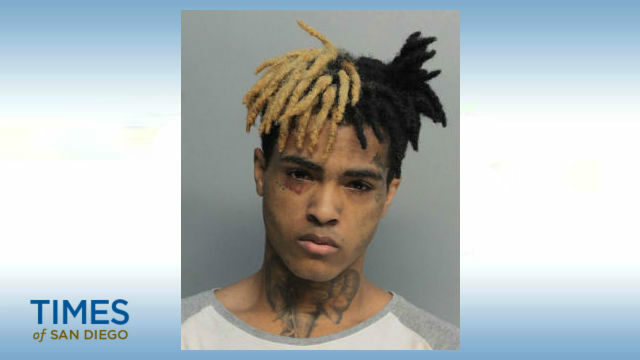 South Florida sheriff’s officials said no suspects had been arrested in connection with Onfroy’s death as of Tuesday morning.